Anyone know where the Western Reaches are located? In Legends the Western Reaches was an area in the southern galaxy west of the Rimma Trade Route to the area immediately west of the Corellian Trade Spine, from the Inner Rim through the Outer Rim. In Canon, the Western Reaches have been extended west all the way to the Unknown Regions, at least in the northern end in the (southern) Inner Rim. Jakku is way too far out into the Unknown Regions... But shouldn't Jakku be moved closer to the frontier of the Inner Rim bordering the Unknown Regions? 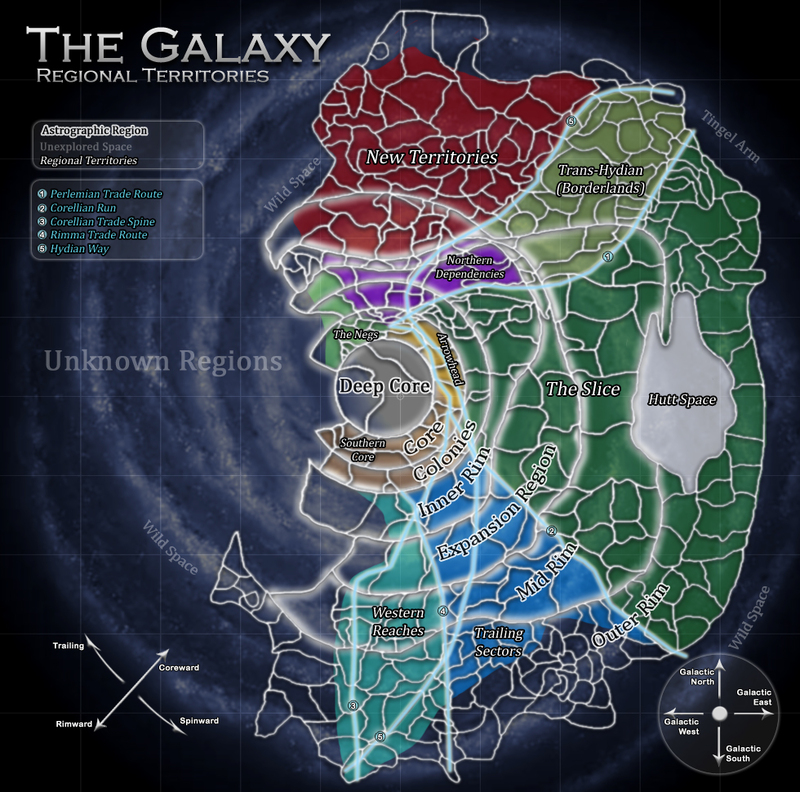 If Jakku was in the Unknown Regions, there wouldn't be any galactic trade going on there or any connection to the Known Galaxy at all... For further proof, look at the canon TFA map: Jakku is right on the Unknown Regions-Inner Rim border, so it definitely needs to be moved. But moving Jakku to the edge of the Inner Rim/Unknown Regions border is something I have to, in good conscience, insist on. you'll see that the Western Reaches are in the Galactic South and don't even extend to the Inner Rim-Unknown Regions border, although it would make sense to me that Jakku would be located there because that's well within the known Galaxy and established trade routes. Jakku being located in the Unknown Regions always struck me as illogical and wrong-headed. If it were up to me, I'd place Jakku somewhere west of the intersection of the Corellian Trade Spine and the Rimma Trade Route, probably along the very western edge of the Western Reaches in the Inner Rim. But everything I've just stated leads us to the inevitable conclusion that the official map is wrong. Yeah, it's not the first time that The Powers That Be have been wrong; continuity snarls requiring retcons happen all the time. And this is just a fan map, so it won't matter to anyone except us. But everything I feel just screams that Jakku is too far out in the Unknown Regions to make any sense. EDIT: Hell, Jakku isn't even located in the Western Reaches in the official map. Just look at the back box denoting the Western Reaches in the official map. Jakku isn't anywhere near it. Methinks Disney goofed big time. I don't suppose there's any way to get in contact with Disney and let them know of this discrepancy? Because if they corrected this before or when Episode VIII comes out, that would be awesome. The only other alternative that would satisfy me is if Meriba would be willing to make a separate file for me that would have Jakku where I want it...but then that would mean every time we make another correction or addition, Meriba would have to do the same thing again to my file. Sutehp, take a deep breath. Not all EU systems have been canonized, but to my knowledge Disney has not moved the location of a single previous film canon system or EU system which has been canonized in the new canon. Also, it seems evident from TFA alone that they took a 5-minute look at the EU galactic maps and consciously chose the western galaxy to be the location of The First Order and other important systems to the third trilogy. (The Unknown Regions were ripe for the picking.) That fact means they are trying to honor the existing galaxy maps for the most important aspects. I think we should be very thankful for that much because they are under no obligation to do even that. However that does not mean that every canon galactic region will have the same exact boundaries as they did in the EU. I'm pretty sure they put Jakku exactly where they wanted it and just redefined "the Western Reaches" in light of the story of the saga going that far into the central western galaxy for the first time. Jakku is in the Inner Rim, not the Unknown Regions. Jakku is a junkyard. It doesn't necessarily need a major trade route going there. It once had a secret Imperial research facility. Jakku may be considered to be very near the Unknown Regions in the new canon. As of the beginning of TFA, Jakku was not a part of the Republic or the First Order. Your ongoing insistence that Jakku's placement is an error is based on an EU-defined region of space. On the official map, the boundaries of the Western Regions are not defined. All we know from dialogue is that Jakku is in the canon version of the Western Regions. Of course you should place Jakku wherever you want for your own personal SWU, but if you still wish to have Disney move Jakku in canon, good luck. 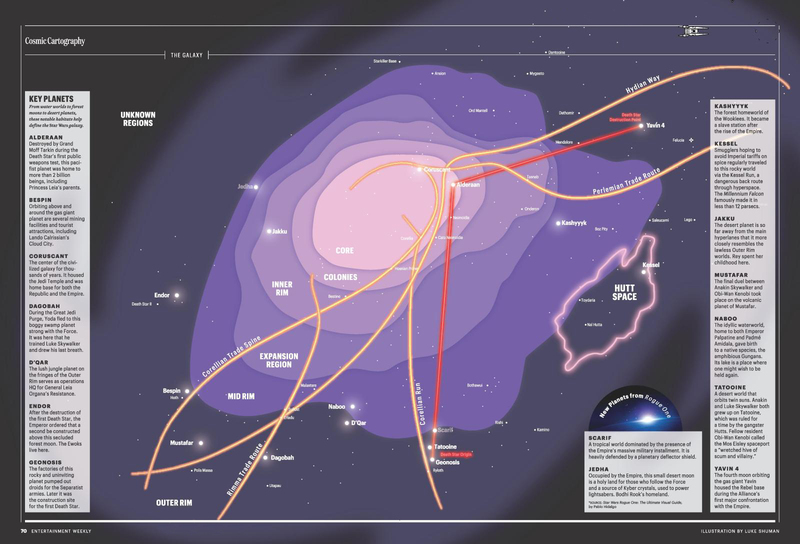 Star Wars Galactic Maps: An Illustrated Atlas of the Star Wars Universe was just released today. I intend to pick it up as soon as I can. I just ordered it myself. Here's hoping for more sector maps of the inner regions! There is no true north in the universe but there is such a thing as galactic north in the plane of Star Wars galaxy. The galactic directions even still exists in canon. It's normal for us to expect north to be oriented as up as real world maps, and it would match most SW galaxy maps we already have. Yes, you are correct that the systems would always be moving like the would in a real galaxy, but the movement is very slow on a galactic scale, so any map could be a fairly accurate representation over the course of even centuries. (It would take a very long time for any system to move outside of the dot on the map.) Just sayin'. Nothing to say about that, as I said, I prefer this orientation because it's more practical to me, and to have access to a different approach. But this is your yard, and you are kind enough to let us play in it. You of course should make the map to your liking first, and the fact that you share it is pure bonus for us. I truly appreciate your work and that you indicated the north direction it as a courtesy. Thank you. Thanks to your corrections and suggestions. I'm just trying to be accurate with canon. Nice, but I don't expect much. I'll hope be wrong. @Sutehp: I use Adobe Illustrator, and the tutorials of its website are great to learn the basics. I'm just trying to be accurate with canon. I find your map to be extremely accurate. I don't expect much. I'll hope be wrong. Meriba, you were right not to expect much. I picked it up today and I am disappointed. It an extremely large hardback children's book with a $25 US retail price. The "map" design throughout is poor, hand drawn, comic bookish, colored-pencil-looking artwork. There is one two-page map of the galaxy that is missing important systems like Scarif. There are no grid lines. There are no region maps or maps with sectors. There are four rectangular cross-regional maps that each "zoom in" on a quarter of the galactic map (which still doesn't show Scarif). The rest of the book is all planetary maps of locations that have a bunch of images representing events that took place there. I haven't compared to other sources in any detail yet but I strongly suspect that the placement of everything is extremely vague because it is just a low-quality kids' book. And to top it off, the paper/ink of the books stinks! So, I am left with just adding new canon star systems to my existing personal space maps. Oh well. Looks like I'll be returning my Amazon.com order post-haste. I should have known it would be a kid's book just by the low-rez pixelated cover (at least the picture *looks* pixelated). On a different note, I just noticed a slight mistake. You have the Herios sector mentioned twice. Once, where it's supposed to be, and another where the Gaulus sector is supposed to be (at the end of the Corellian Run). I really appreciate this, thank you. Which file do you need to print your map? Ai or pdf? I can reup the corrected file if you want. Jason Fry hangs out there, and The Powers That Be do consult with him. He is also still working, or intending to work, on defining the sector maps of the inner regions of the galaxy. On the orientation of the map, I understand different preferences. As you can see above, the landscape orientation really does work very well as a wall map. Sir, you made my day! This is AWESOME!!! I'm sorry for the delay sending a new file. It's odd and exciting watching this printed and exposed in another continent. Thanks for the picture. That. Is. Truly. Awesome. The only thing I've ever seen that compares to that is the full map of Exalted, 3rd Edition. (OT: I even ordered one of them as part of the E3 Kickstarter, so that will be hanging on my wall soon!) This is definitely something that I'd consider worthy of hanging on my wall too. I fully admit to nitpicking. It's what I do whenever I see what seem to me to be glaring visual mistakes. Things like this really do stick out like sore thumbs to me and my sense of order demands that I at least try to correct them. Perhaps Whill and Mikael Hasselstein are right and my nitpicking will come to nothing, but I at least have to try. Thank you, Mikael, for the opportunity to contact Jason Fry. Also, thank you for letting us know that Jason Fry is at least still intending to map the sectors of the inner regions. That gives me hope for a complete Star Wars map someday. And I'd love to see what Meriba does with that information, too. EDIT: which starship is that model in the map pic supposed to be? The flaps on the sides suggest a Victory-class Star Destroyer but the bridge superstructure is all wrong. That's a Raider-class corvette, right? You're more than welcome. You made it possible. I'm also talking about it with people on the Fantasy Flight Games forum, so you may see more downloads happening soon. Yes, that is the Raider-class corvette, which was developed by Fantasy Flight Games and Lucasfilm specifically for the X-Wing Miniatures game. It's now in Armada too, but it's tiny in that game, whereas in X-Wing it's huge. Ok, I just scanned the Rogue One 2 page map of the Galaxy from Entertainment Weekly. Here's hoping I can get images of my scans onto this post. EDIT: Ok, I uploaded the scans into my GoogleDocs folder, but I need advice on how to upload the images onto my post. FYI, the files are PDFs, not jpegs or any other sort of image file. Apologies but I'm not a IT expert. Basically, this map from Rogue One has the new locations of Scarif (which is located in Arkanis Sector just inside the Outer Rim border; sorry, Meriba, Arkanis Sector is gonna get even more crowded!) and Jedha, which is located in the Galactic West in the Inner Rim, which is even deeper into the area that I thought was part of the Unknown Regions. (I've guesstimated that Jedha is somewhere in square H-12 of Meriba's map, but I'll let him make the judgment if and when I can upload the Rogue One Map here.) Apparently, the Unknown Regions in canon continuity is just the Outer Rim of the Galactic West if the locations of Jakku and Jedha are any indication. Also, thank you for letting us know that Jason Fry is at least still intending to map the sectors of the inner regions. Jason Fry is a top shelf guy. I fully admit to nitpicking. It's what I do whenever I see what seem to me to be glaring visual mistakes. Things like this really do stick out like sore thumbs to me and my sense of order demands that I at least try to correct them. Perhaps Whill and Mikael Hasselstein are right and my nitpicking will come to nothing, but I at least have to try. Nitpicking and pointing out glaring mistakes that stick out like a sore thumb are two very different things so I don't see how you can equate these two types of criticism. What you say are "glaring visual mistakes" of the new canon are based on an EU map that is no longer canon. Disney is under no obligation to maintain prior region boundaries. There is no issue with placement of Jakku if the prior boundaries of the Western Reaches have been expanded. Sometimes the simplest solution is the best. Now if you had just expressed being disgruntled that Disney is redefining the boundaries of galactic regions from the way you like it in the EU, I still wouldn't understand why that is a such big deal to you but at least I could understand why you want it changed. But you are saying an error was made, and I fail to see how Disney has made any mistakes in placing Jakku when there still haven't been any canon maps defining the exact boundaries of the Western Reaches. We know from canon film dialogue that Jakku is in the Western Reaches. We know from multiple canon publications where Jakku is. Therefore, the Western Reaches of the canon universe extend to where Jakku is. Why is the expansion of the Western Reaches a problem for you? I think it was very cool that a film even threw a bone to the Legends Essential Atlas. They could have said no region name or made up a new one. It's basically a throwaway line in the grand scheme of things, but it's an easter egg of sorts for us nerds. And said by Harrison Ford too! ...Jedha, which is located in the Galactic West in the Inner Rim, which is even deeper into the area that I thought was part of the Unknown Regions... Apparently, the Unknown Regions in canon continuity is just the Outer Rim of the Galactic West if the locations of Jakku and Jedha are any indication. What you thought based on EU continuity, which is not necessarily in effect for the canon universe. Since Jedha is part of the Empire in the classic area, it seems safe to say it is possible that the Unknown Regions may have shrunk from their prior boundaries in the EU. It's a simple solution based on Disney's obvious willingness to alter prior EU regional boundaries. The Unknown Regions are a little less unknown now. Still plenty of room left for the First Order to rise and gain power in. Thank you for that link, Whill. I hope Meriba finds it useful for his map. I understand all that now. With the placement of Jedha in the Western Reaches, it's become obvious to me that Jakku's placement where it is in the Inner Rim was not an accident. So yes, while Jakku's placement was a problem for me because I thought it was an oversight by Disney, I've since seen that the placement of an additional planet, namely Jedha, in the same region proves to me that Unknown Regions in Legends continuity is significantly larger than the Unknown Regions in the present canon. I get that now. Again, that's the point I was trying to make above. The Unknown Regions did shrink in the switch between canons. It wasn't obvious to me that that was the case when we only had Jakku in the western Inner Rim. With the addition of Jedha (a planet so long a part of galactic civilization that it was a Jedi planet for centuries at least [remember those fallen giant Jedi statues?]) in the western Mid Rim, it becomes blatantly obvious even to me that the Unknown Regions of Legends are not the same as the Unknown Regions in the current canon. What I thought was an oversight is instead a retcon. Now that that has become obvious to me, I can accept it. A planet where people regularly made pilgrimages to honor the Jedi and where, before the Great Jedi Purge, the Jedi would travel to acquire their own lightsaber crystals is, by definition, not a planet that would be lost in the Unknown Regions. People regularly traveled to Jedha before the Empire was there (again, see those giant Jedi statues). Hell, we know that Jedha was part of galactic civilization because the Empire even went through with a cover story for the rest of the galaxy that Jedha suffered a "mining accident." The Empire wouldn't have bothered with that if Jedha was in the Unknown Regions and thus cut off from all civilization. This is even more proof that the Unknown Regions of the two continuities are significantly different sizes and thus more proof of a retcon I was previously unaware of. Your rationale makes a lot of sense to me. Honestly I never cared for the regions all showing in the EU as being rings all the way around the Core when most of the western portions of the rings were really not even part of the Republic/Empire, instead being part of the Unknown Regions. I think I like it better this way now. The Unknown Regions are smaller now but the First Order still has somewhere to grow in secret. There is still Wild Space. I didn't mind the Legends explanation that the Galactic West was impassable for "hyperspace navigation reasons" or whatever. Although it did make me wonder how Admiral Thrawn managed to join the Empire when the Chiss Ascendancy was smack dab in the far side of the Unknown Regions. I never did bother to read Outbound Project. But yeah, I agree with you that the Unknown Regions are still plenty large enough to accommodate the building war machine of the First Order. Even with Jedha being on the far west side of the Mid Rim, that still leaves all of the western Outer Rim to play in, including for Starkiller Base. Although seeing Ahch-To, the site of the first Jedi Temple, in what used to be the Unknown Regions in Legends continuity did throw me for a loop. When I saw that the first time I saw TFA, I was like "wait, the Jedi somehow joined galactic civilization 25,000 years ago after migrating from the Unknown Regions, a supposedly impassable area of space? How does that work?" That should have been the first clue that these aren't your daddy's Unknown Regions. My thinking that Jakku was erroneously located in the Unknown Regions was the result of the same thinking. Now with a third planet (namely Jedha) located in the Galactic West, it's obvious (to even me, now) that these aren't oversights or mistakes. This raises the question of how Ahch-To got "lost," since Luke had to go looking for the first Jedi Temple and no one could follow him without him leaving clues to his location with Lor San Tekka. Maybe we'll find out in Episode VIII. I'm also hoping that we get an official location for Ahch-To on the galaxy map so's Meriba can put it on his map. Here's hoping. Although it did make me wonder how Admiral Thrawn managed to join the Empire when the Chiss Ascendancy was smack dab in the far side of the Unknown Regions. I never did bother to read Outbound Project. Outbound Flight was absolutely horrible. Obi-Wan and Anakin were initially sent on the Outbound Flight in an overtly contrived way to just include film characters in the story, and they had absolutely no purpose in the story before being summoned off the ship by Palpatine before it left the Republic. Jorus C'baoth is a total @sshole from the very start, way before he crossed over to the Dark Side. There is no way in hell he could ever have been a Jedi Knight let alone Master. And Thrawn somehow becomes the tragic hero of the story who saves his people and then gets exiled due to his methods. Thrawn became allies with Darth Sidious in this book, which is set in between Episodes II and III. So it was the events surrounding the doomed Outbound Flight deep into the Unknown Regions that connected Thrawn with the future Emperor.